Eggs are composed of a yellow yolk and translucent white fluid called albumen. They can be eaten raw, scrambled, poached, boiled, fried or as an ingredient in innumerable dishes. They help in coagulation, foaming, emulsification and browning. However, eggs—and in particular egg whites—can cause adverse side effects. Most people who are allergic to eggs are actually allergic to the proteins found in the albumen, or white portion of the egg. Egg allergies usually appear in very young children who outgrow the allergy by age 5, according to Kids Health. Allergic reactions can happen from a few minutes to a few hours after exposure to the egg. Symptoms can include rashes, hives, general redness and swelling of the skin, cramps, diarrhea, nausea and vomiting, runny nose, itchy and watery eyes, as well as sneezing, coughing and wheezing. The reactions can also lead to an asthma attack. These symptoms usually last less than a day. Severe allergic reactions can cause swelling of the mouth, throat and airways, difficulty breathing, and a sudden and dangerous drop in blood pressure, leading to dizziness and loss of consciousness. Eating raw egg whites can cause a depletion in biotin, also known as vitamin B7, vitamin H or coenzyme R. In raw eggs, biotin is bound to avidin. When the egg is cooked, the biotin separates from the avidin, allowing the biotin to be absorbed by the body. Biotin deficiencies lead to skin disorders such as cradle cap in infants and seborrheic dermatitis in adults. Severe biotin deficiencies can lead to hair loss, seizures, lack of muscle coordination and lack of muscle tone, muscle cramps and pain. 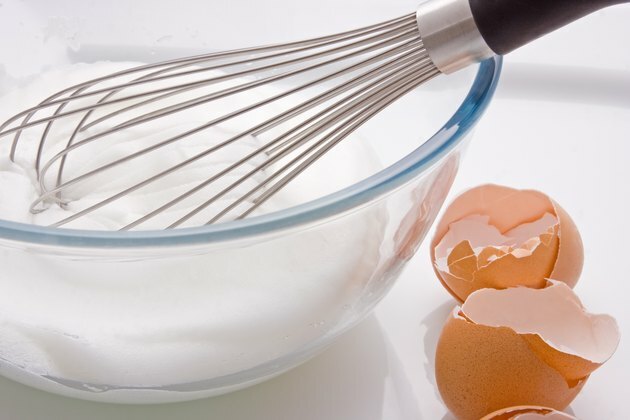 Raw eggs, including raw egg whites, raise safety concerns regarding bacterial contamination. Salmonella is a bacteria that often causes food poisoning, and it is found in chicken intestines and therefore can be present on the outside of unbroken eggs. Salmonella can also be found inside the raw eggs. Salmonella can be destroyed in the cooking process if the temperature is high enough or the cooking time is long enough. Soft-boiled eggs and sunny-side up eggs, for example, can still contain live salmonella. Symptoms of salmonella food poisoning include fever, nausea, dehydration, abdominal pain, cramping and headache lasting four to seven days. Most patients recover with antibioitics, but infections can enter the bloodstream and affect major organs, resulting in death. "The Washington Post" reported in July 2009 that about 142,000 Americans are infected each year with Salmonella enteritidis from eggs, and about 30 of them die.